A single decade rosary is a small ring of ten beads with an attached crucifix. The devotee counts the same ring of ten beads repeatedly for each decade until they are done with their prayers. The single decade rosary is significantly smaller than a full-size rosary and is easily concealed. Other styles include the finger rosary, which is worn like a ring and features a series of 10 beads or markers and a crucifix. The one decade rosary or single decade rosary came about as a result of religious conflict in 16th and 17th century Ireland. During the time, Roman Catholics were being persecuted and severe legal penalties were prescribed against those who were caught practicing the religion. To help conceal activities, small, easily hidden rosaries were created to avoid persecution. 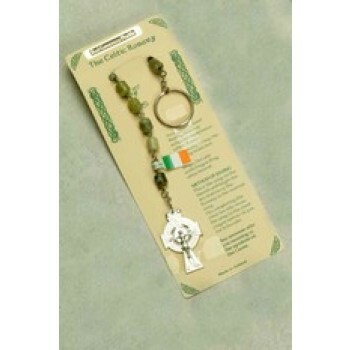 Because of this, single decade rosaries are sometimes called Irish penal rosaries. 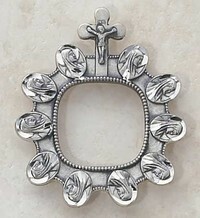 The finger rosary is another variation on a small, concealable design. Finger rosaries are small enough to be worn as a ring and the most simple of designs are indistinguishable from a regular ring when observed from a distance. The rings could also be easily removed and concealed as needed. Matthew F. Sheehan is proud to offer a large selection of single decade and finger rosaries to choose from. Whether you're looking for a unique sterling silver finger rosary or a beautiful mother-of-pearl one decade rosary, you'll find everything you need to worship the way you like at Matthew F. Sheehan.